Jeff Milene was in his second season as a pro in 1989. He was also in his second season at rookie Elizabethton, injuries helping limit his time and keep him there, according to The Rochester Post-Bulletin. Milene, though, remained upbeat, he told The Post-Bulletin. "Baseball has a lot of ups and downs," Milene told The Post-Bulletin that July. "You sit for a week and you get down, but I decided to not let it affect me. I know I'm just 19 years old and I'll wait for my turn." For Milene, though, his turn never came. He played in just one more season as a pro. He never made AA. 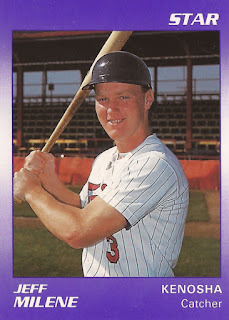 Milene's career began in 1988, taken by the Twins in the 21st round of the draft out of Mayo High School in Rochester, Minn.
Milene started with the Twins at Elizabethton. He got into eight games that year. He then returned there for 1989, getting into just 14 contests. Between the two seasons, he picked up a total of eight hits. For 1990, Milene moved to single-A Kenosha and then to high-A Visalia. He got two games at Kenosha and 22 at Visalia. He hit just .106 total, ending his professional career. Milene soon returned to Rochester, but he continued playing. He served as player and manager for the Rochester Royals amateur baseball team for 11 seasons, ending in 2004. In June 1999, Milene's Royals hit themselves to a 17-0 win, according to The Post-Bulletin. "We swung the bat well; everyone hit the ball well at least once," Milene told The Post-Bulletin. "We have as good an offense as there is in the state."